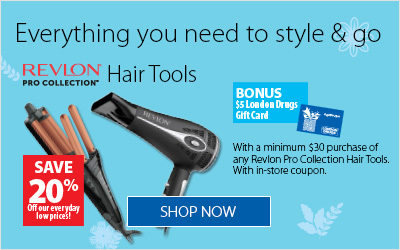 London Drugs Hair Care – a full selection of hair care products and accessories, including shampoo, conditioner, hair colour, hairsprays, gel & wax and an assortment of hair styling tools for cutting, drying and curling hair. Shop for trusted brands 24/7 anywhere, anytime. London Drugs has everything needed to keep your hair looking and feeling healthy. Whether your hair is dry and damaged, fine and limp or tends to be frizzy, shoppers will find deep conditioners that banish frizz, help with colour treated hair and bring back shine and softness to damaged hair. Choose rinse or leave-in formulas from trusted brands for all hair types. Along with shampoos and conditioners designed to strengthen hair, our selection includes dandruff and scalp care for men and women. Colour away the gray or try out something new with our complete range of hair colour for men and women. Find Garnier, L’Oréal, Revlon, Nutrisse, Natural Instincts and Just for Men products to add some blonde highlights, touch up gray hair or change your overall hair color. Get ready to define curls, manage frizz, add volume or hold a hair style with our style aids. Find mousse, gel & wax, creams and sprays from your favourite hair styling brands. Create and maintain hair styles with the right hair styling tools. From every day combs to styling brushes, hair dryers, flat irons, curling irons & rollers – you’ll find the right tool in our hair care department. Stock up on hair implements and accessories like scrunchies, ouchless elastics, hair nets, clips, fashion barrettes and headbands. We’ve made our site user friendly with drop-down features that let you browse items by brand, price range and more.